O’Haire Trailers presents the Beavertail Car Transporter from Ifor Williams. 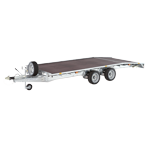 This model of car transporter is closely related to the Ifor Williams flatbed range of trailers. The Beavertail has the addition of a sloping rear bed section that provides the flexibility of a flatbed with the added benefit of a low loading height to the rear of the car transporter trailer. 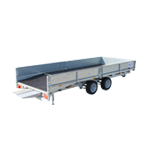 The Beavertail car trailers from Ifor Williams are available in width options of 1.98m/6’6″ and 2.25m/7’6″. Length options on this Beavertail Trailer measure 4.23m/14’ and 4.77m/16’. Ifor Williams Beavertail trailers are fitted with key design features, synonymous with the Ifor Williams Trailers brand as standard. The Beavertail range of car transporter can be further enhanced with many of the same accessories as the flatbed range of trailers. 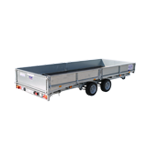 Closely related to the flatbed range, and with the addition of a sloping rear bed section, these trailers offer the flexibility of a flatbed with the added benefit of a low loading height to the rear of the trailer. Available to view in the Paraic O’Haire Trailers showrooms in Kilmaine.